Apart from some obvious ways of reducing your car insurance premiums, such as insuring your car for Market Value instead of Trade Value – you could simply switch to one of the cheap car insurance companies in South Africa. Most car insurance companies will offer you an improved premium on the initial quoting phase and if you are lucky, they should only increase your premiums if you make a claim or once a year in-line with inflation. If you have been unfortunate, and find that your premium has increased to an amount that you find unacceptable, then you might want to consider shopping around for cheap car insurance quotes from a few different insurers in South Africa. Obviously you are one of those pro active people who is making an effort to find cheaper alternatives – but for many, the process of having to find new quotes is unbearable. And car insurance companies know this and too often people pay far higher premiums than they should be paying. You’ll have noticed the cost of your car insurance increasing every year. In most cases the increase is far higher than an inflationary increase and in some cases it is as high as 20%. When questioned about this increase, the insurance companies representatives explained that it was due to a weakened Rand and the repair and/or replacement costs for accident damaged vehicle is therefore higher as the cost of replacing crash damaged parts is high. Thankfully we can provide at least a few of the cheap car insurance quotes to you by leaving your details in the form below. Car insurance, or vehicle cover as some call it, is something you need if you own a car. It can save you a lot of time and frustration if you ever find yourself in a car accident. If you’re looking for a cheap car insurance quote, you can fill out your details here. South African motorists are at the mercy of the economy when it comes to finding cheap car insurance because a lot of manufacturers import their car parts. This fact hits home when you realise the Rand has depreciated over 50% in the past 2-3 years. This pushes parts prices sky high, along with your car insurance premium. It’s a ripple effect that carries on through from tow truck services to having your car repaired. Are you looking for affordable car insurance? It can be difficult and tedious to get car insurance quotes from several insurers. You have to speak to each insurer individually and spend up to an hour on the phone giving them your personal details and negotiating the price of your monthly premium and excess. The truth is, the economy is no where near as great as it used to be and car insurance companies need to reinvent what car insurance is all about. The industry needs cheap car insurance that real people can afford on the very real tight budgets that the economy has put them in. It’s becoming abundantly clear that South Africans need cheap car insurance. The cost of ownership of a car for an average middle-income earner can range anywhere between R4500 to R6000, which is a big sum considering that’s between a quarter and a third of the earner’s salary. This includes petrol which has been increasing more and more each year to the point where petrol is now over R16 a litre. This is the most expensive petrol has ever been in the history of South Africa. In addition to this, the government has increased the fuel levy for the first time in years, compounding the issue. Car maintenance is another big hurdle involved in the cost of vehicle ownership. Servicing and the cost of replacement parts can be anywhere from R1000 or more depending on where you get your car serviced. Doing it through the dealer you bought your car from will always be more expensive because you’re paying for original parts. You’re essentially paying for the name in the same way you pay more for branded clothing versus non-branded clothing. Servicing your car at an independent service centre is the equivalent of non-branded clothing. Just be sure to check that you’re servicing your car at a reputable independent service centre because there are some that try to make a quick buck by replacing parts with older parts. Car insurance is the most varied cost in the whole car ownership equation. Comprehensive car insurers use something called risk profiling when giving a person a car insurance quote. This risk profiling takes into consideration so many details such as where you live, how old you are, whether you’re married or not, where the car is parked (day or night), how much security is involved in keeping the car safe and how long you’ve been driving for…just to name a few. It’s a system that isn’t fair to poorer motorists since a lot of the requirements, such as security and where you live, require earning a higher salary and since less security is a bigger risk, comprehensive car insurers charge poorer motorists a higher premium. Many of South Africa’s roads are poorly maintained by the government, leading to an average of 13 000 – 14 000 deaths on our roads a year. The culprits behind increased car insurance claims are potholes, faded road markings and signs, and faulty or broken traffic lights. In addition to this, many motorists believe the rules of the road don’t apply to them. Coupled with ineffective policing, this further compounds the issue. Comprehensive car insurers need to tackle this issue by providing a cheaper car insurance package that adds real value and protection to motorists and their cars. What Car is the Cheapest for Insurance to Repair? The below information is sourced from our friends over at Kinsey Report, who have been doing vehicle cost comparisons for decades. We segment this data into 9 categories to determine which one of these cars is the cheapest to insure based on the cost of replacement “crash parts”. This is different from the full Kinsey report where the total cost of replacements parts are covered, which also includes items that would most likely not be damaged in a motor accident. Service and wear & tear items are therefore excluded in this report as we only deal with parts that would most likely be damaged in a car crash and need to be replaced through your insurance. For ease of use we will keep the sections, makes and models in the same order as the original Kinsey Report so that you can reference easily. – Administrative Costs: Insurance and Warranty (both of which are optional). The physical costs are dependent on your usage of the vehicle, how far you drive and your driving style of course. If you corner hard and accelerate like Lewis Hamilton then your wear & tear and fuel costs will be higher than average. These physical factors are naturally within your control though, but what about the administrative costs? As you’re aware, several factors go into assessing your personal insurance risk profile that ultimately determine how much you end up paying for car insurance. For example, as you get older, car insurance gets cheaper until about 65 and then it gets more expensive again. Also where you keep your car at night – in a garage or does it stay on street. Is your neighborhood a safe one? These location and age based criteria are pretty difficult to change, so it’s not reasonable to suggest these as potential for cost savings. But in terms of actual car costs there’s not much you can do apart from choosing a luxury sedan that costs less to insure. Which family car is the cheapest to insure? We look at 5 family cars from the 2017 Kinsey Report. In order to gear this report for the purpose of accident damage and total vehicle replacement, we have done a slight modification to the table by using only the Retail Selling Price and then comparing this to Sub Total C. This Sub Total is a collection of the most common physical exterior parts that could be damaged in an accident. It’s highly unlikely that all of these parts would be damaged in a collision, but it’s a very good reference point. It’s also important to note that this excludes the actual physical manual labour cost of replacing the parts and the paint work, assuming that this would be similar in all makes of vehicle. According to Kinsey, these cars are family favourites, two of which belong to Toyota. While the crash parts as a percentage of the selling price isn’t the lowest for the Toyota Corolla 1.6 Quest, its actual Rand value cost is, sitting at R 50 489.97. 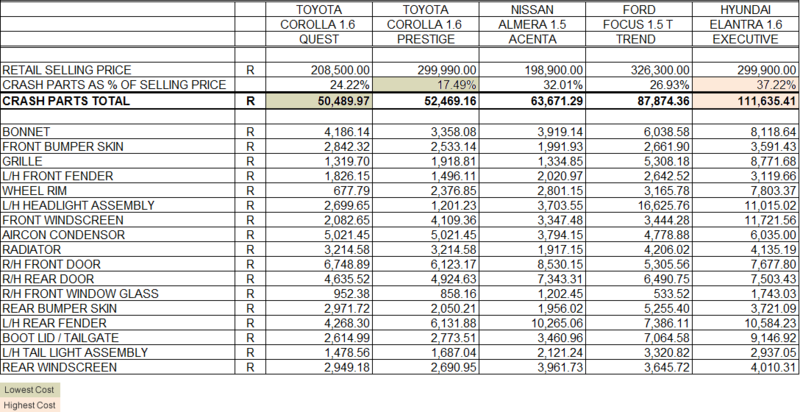 The crash parts as a percentage of the selling price for the Toyota Corolla 1.6 Prestige on the other hand is the lowest, sitting at 24.51%. This is obviously because the two cars use almost the exact same parts. The Nissan Almera 1.5 Acenta is interesting. It’s just over R 10 000 cheaper than the Toyota Corolla 1.6 Quest and is the cheapest of the family cars on this list and the total crash parts cost is only R 13 000 more than the Toyota Corolla Quest. The Ford Focus 1.5 Trend is the second most expensive car on the list and costs almost R 120 000 more than the Toyota Corolla Quest. Its total crash parts cost is more than R 35 000 more expensive as well. 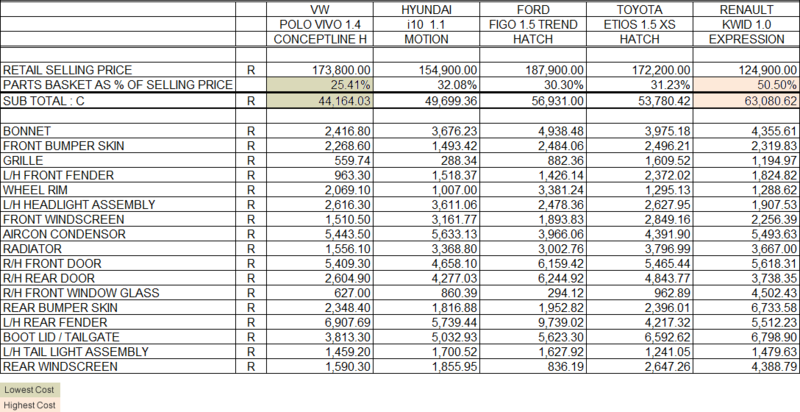 The Hyundai Elantra 1.6 Exclusive has the most expensive crash parts basket on this list, sitting at R 111 635.41. That’s more than double the total crash parts cost of the Toyota Corolla Quest. Our personal choice would be the Toyota Corolla 1.6 Prestige. It may be more expensive than the Quest, but because the parts are almost exactly the same, you get a bit more value for money in the long run. Toyota also has a reputation for long lasting cars which is why we chose it over the Nissan Almera. Which city and entry level car is the cheapest to insure? Here we look at 5 city and entry level cars from the Kinsey Report. 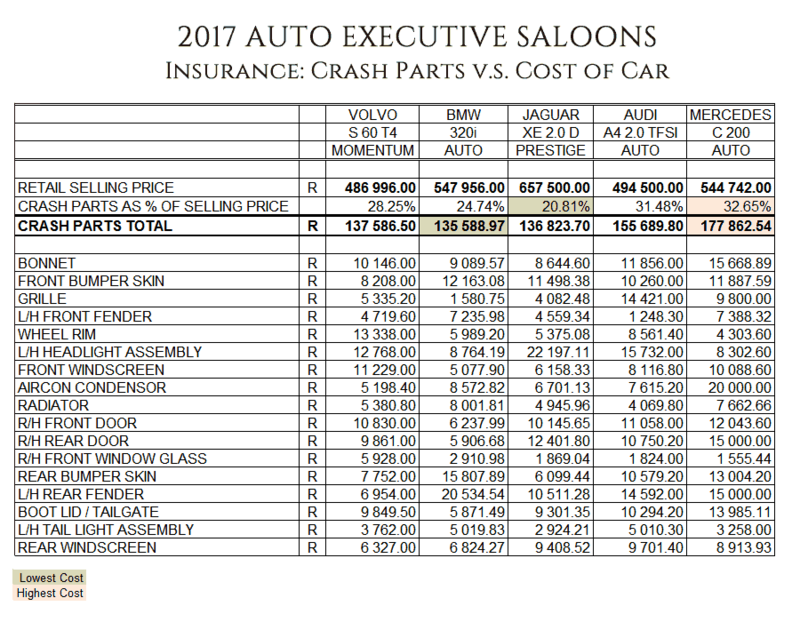 In order to gear this report for the purpose of accident damage and total vehicle replacement, we have done a slight modification to the table by using only the Retail Selling Price and then comparing this to Sub Total C. This Sub Total is a collection of the most common physical exterior parts that could be damaged in an accident. It’s highly unlikely that all of these parts would be damaged in a collision, but it’s a very good reference point. It’s also important to note that this excludes the actual physical manual labour cost of replacing the parts and the paint work, assuming that this would be similar in all makes of vehicle. Our first car on the list is the VW Polo Vivo 1.4 Conceptline, which has the cheapest crash parts basket of the five cars. The total crash parts cost as a percentage of the selling price is also the best of the cars on this list. Everyone knows VW’s are popular cars and this is a double edged sword for consumers because their reputation makes them more appealing to hijackers. VW’s are high risk and so while replacement parts are cheap, insurance is still going to be higher than any other car on this list. Next up is the Hyundai i10 1.1 Motion. It has the second cheapest crash parts basket, but its total crash parts cost as a percentage of the selling price comes in at 4th place of the five cars. However, the cost of the car is the 2nd cheapest. The Ford Figo 1.5 Trend’s total crash parts basket is the 4th cheapest in this list. It’s also the most expensive car, selling at a retail price of R 187 900. The total crash parts cost as a percentage of the selling price is the second lowest though and is only marginally more expensive in actual Rand value than the Hyundai i10. The Toyota Etios 1.5 XS is up next and is similar to the Ford Figo. Its retail price is 9% cheaper than the Figo and the total crash parts cost as a percentage of the selling price is only 1.23% higher. The Rand value of the crash parts basket comes in cheaper than the Figo though and is the 3rd cheapest of the cars on this list. Lastly we have the Renault Kwid 1.0 Expression which is the cheapest car of the five. However, the replacement parts cost the most and totals 50.50% of the retail value of the car. Our choice would be the Hyundai i10 if you’re purely looking at saving money. If you want a little more style while still saving, we suggest you go with the Ford Figo. Which luxury car is the cheapest to insure? To answer this question, we head over to our friend http://www.kinseyreport.co.za/2017_kinsey_report.htm#Executive%20Saloons. In order to gear this report for the purpose of accident damage and total vehicle replacement, we have done a slight modification to the table by using only the Retail Selling Price and then comparing this to Sub Total C. This Sub Total is a collection of the most common physical exterior parts that could be damaged in an accident. It’s highly unlikely that all of these parts would be damaged in a collision, but it’s a very good reference point. It’s also important to note that this excludes the actual physical manual labour cost of replacing the parts and the paint work, assuming that this would be similar in all makes of vehicle. Right, so the Jaguar XE 2.0 D Prestige tops out as the most expensive car in the above table and so the insurance cost will be the highest to replace if stolen. It’s a good R100k more expensive than its closest rivals, the BMW 320i Auto and the Mercedes Benz C200 Auto, so it’s far from the cheapest car here. But it scores the lowest in the crash parts basket, in relative terms. However, because of its high replacement cost due to write-off/theft, it’s unlikely to be the cheapest to insure. The BMW 320i Auto has the cheapest crash basket in terms of actual cost, and is second cheapest in relative terms too. But it’s not the cheapest car here and sits right in the middle of the 5 cars for replacement cost. The Audi A4 2.0 TFSI Auto is the second cheapest car – but the parts basket is the second most expensive, so that’s not it either. The Mercedes C200 Auto is just a hair cheaper than the BMW for total cost, but it’s parts basket is sadly the most expesive in relative 32.65% and actual cost. And then finally, the Volvo S60 T4, which is the cheapest of all the luxury automatic sedans, but very similarly priced to the Audi A4. In terms of crash parts it’s right in the middle of all the cars, but with only R2 000 difference between the cheapest, there really isn’t much to compare. Because the Volvo is the cheapest car here, and because it’s crash parts are really quite reasonable – I’m going to have to go with the Volvo being the cheapest insurance option. But, it’s important to understand that car insurance is heavily dependent on your personal risk profile and less to do with the car you drive. The whole point of this exercise was to determine which luxury car would be the most affordable to insure, and the deciding factor is a balance of vehicle value and the cost to repair (the crash basket parts). Something to consider: Are you more likely to drive the BMW with a heavier foot than say the Mercedes? It’s possible given that you might feel more inclined to relax in the incredible Mercedes comfort as opposed to being more racy in the harder BMW. Same goes for the Jag – it’s plush!! The Audi is also quite perky and racy too. The only true way to discover which is the most affordable is to get a quote based on your personal risk profile which you can do very easily by getting Compare Car Insurance to call you back with multiple quotes. Go for it!